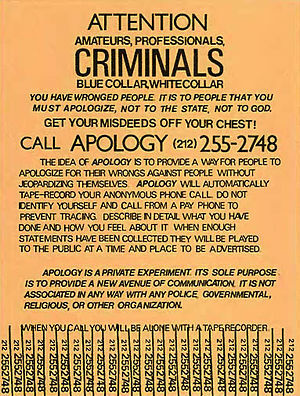 The original “Apology Line” from 1980-1995 was the brainchild of conceptual artist Allan Bridge, who posted fliers in New York City requesting that people call his answering machine to confess to anything they felt guilty about. The fliers prompted a flurry of phone calls to his machine, which led to a magazine (“Apology”), an HBO film based on the project (“Apology”) with Leslie Ann Warren and Peter Weller, as well as several different projects over the years where the calls were played. The calls ranged from the mundane (lying about going to a family gathering) to the truly criminal and scary (rapes, murders). Since it was all anonymous, it’s not clear how much was true and what wasn’t. However, if you want to examine the human mind at its darkest, this is a good place to start. I first heard about the Apology Line back in the fall of 1984 when the USA cable network’s late night show “Night Flight” featured a short documentary about the Apology Line where several of the calls were played. It was probably one of the most disturbing things I had ever encountered at that point. Please note that none of what you’ll see or hear is safe for work or little ones. You are literally hearing the darkest parts of the human soul being expressed here … so be warned.